Saint Meletius of Antioch (Μελέτιος) was a Christian bishop, or Patriarch of Antioch, from 360 until his death. 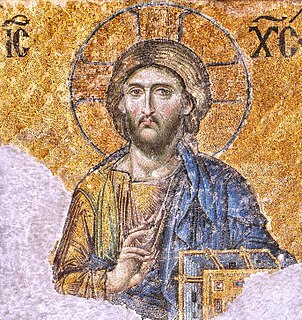 There were contrasting views about his theological position: on the one hand, he was exiled three times under Arian emperors; on the other, he was strongly opposed by those faithful to the memory of the staunchly pro-Nicene Eustathius of Antioch, whom the synod of Melitene deposed for his Homousianism, which they considered a heresy, and by Saint Athanasius of Alexandria, the firm opponent of Arianism. One of his last acts was to preside over the First Council of Constantinople in 381. Simplician was Bishop of Milan from 397 to 400 or 401 AD. He is honoured as a Saint in the Roman Catholic and Eastern Orthodox Churches and his feast day is August 14. 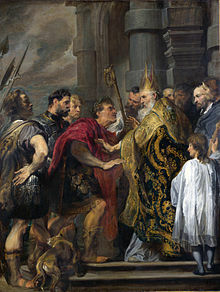 Saint Ambrose influenced the anti-paganism policy of several late Roman emperors including Gratian, Valentinian II and Theodosius I. 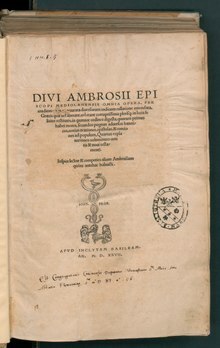 Under the influence of Saint Ambrose, Theodosius issued, in the year 391, the "Theodosian decrees," a declaration of war on paganism, and the Altar of Victory was removed by Gratian. 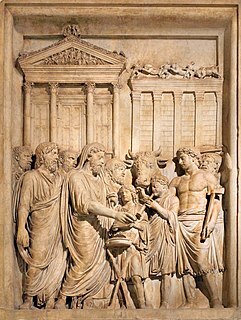 Ambrose prevailed upon Gratian, Valentinian and Theodosius to reject requests to restore the Altar.